I love desserts, especially anything chocolaty. 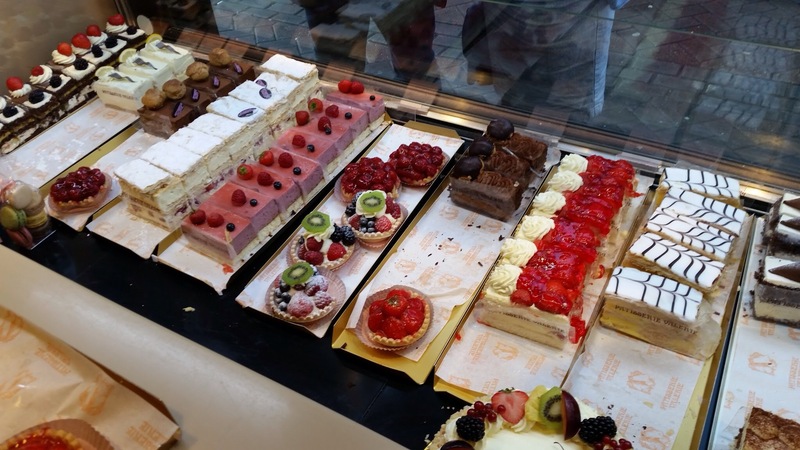 Since I was in Europe where some of my favorite desserts come from, I went and investigated the dessert scenes in Edinburgh. Patisserie Valerie is a chain bakery and I visited one on Rose Street (next to the famous pub Rose & Crown) in the Edinburgh town center. I was a bit hesitant when I saw only this display case of cakes. Was not terribly impressed. These are my selections. 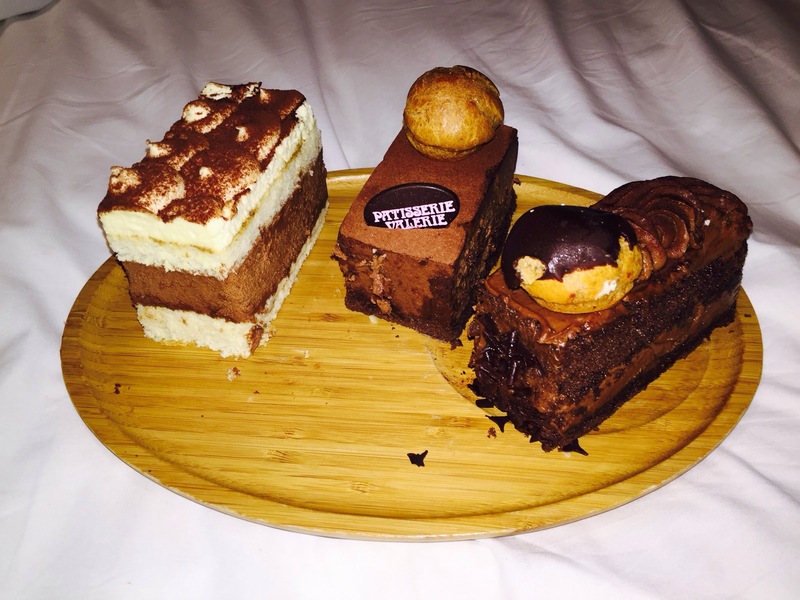 From left to right: tiramisu, chocolate mousse, and double chocolate cake. This is my ménage à trois of desserts where both chocolate cakes triumphed. The chocolates were dark and not repulsively sweet like the Godiva. The mousse had the perfect texture- beaten just soft and fluffy enough to caress with a lingering sweet aftertaste. The double chocolate cake was perfect in taste- the spongy dark Belgium chocolate cake portion coupled with smooth/soft cream puff on top played well off each other. 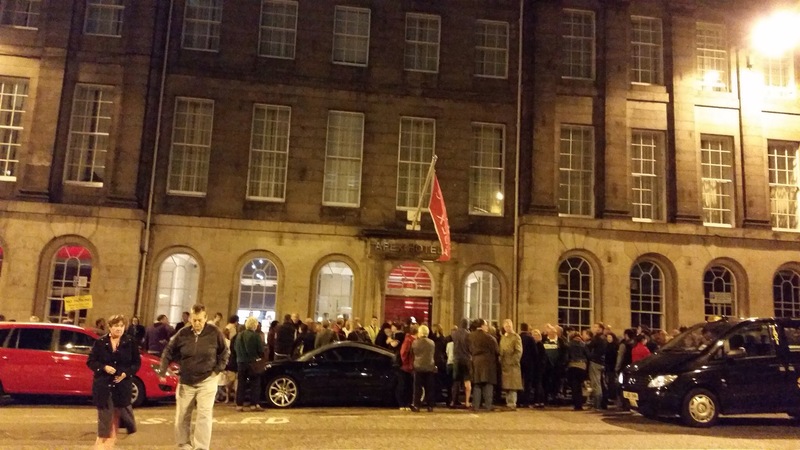 As life would have it, the fire alarm went off at 1:43am in the morning in the hotel while I was enjoying my cakes. I got myself out of the room after my call to the front desk went unanswered. The customer service at the Apex Waterloo Palace Hotel was not excellent. Furthermore, both their paid search and organic research results are currently linking to a runtime error page. Obviously their digital marketing efforts also sucked. Definitely check out Patisserie Valerie when visiting Edinburgh but not the Apex Waterloo Place Hotel. Patisserie Valerie is well worth a stop and a cup of tea. Zum Stammtisch is a German restaurant in Glendale, Queens NY. I was there soon after the New Year’s for a pre-concert meal. Worse, I was there after an unexpected negative emotional disclosure and my digestive system was upset. Therefore, it’s entirely possible that I was off my game and my recount here is biased. In addition, German cuisine has not been high on my list (Really, is it high on anyone’s list other than German’s?) and I have had limited exposure to German food. I could count the number of times I had German food – hmmm, once in Salt Lake City, Utah, once in the Epcot Center in Florida, and once at home made by my German au pair, Izzy. Maybe the fourth time is the charm? We arrived around 6pm and the restaurant was already busy. Luckily we got seated immediately. The restaurant appeared to have a huge following and had been in Glendale since 1972. It also won various recognitions and mentions. The German cuisine is well-known for its wieners and I could not wait to try them. I love sausages of all kinds; my favorite is the Algerian Merguez. See my prior post on my Merguez experience in Montreal. This bread may look ugly but it was much better than expected: had all the right attributes for being a bread (other than the ugly physical appearance). The bread was warm; the crust was crunchy and crumbly; and the middle was soft and spongy with a sweet after taste. 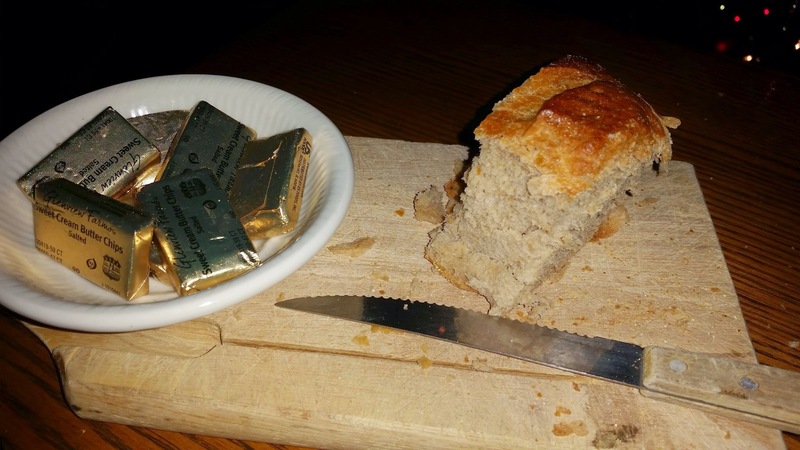 I buttered the bread well – too bad the butter came cold and hard. 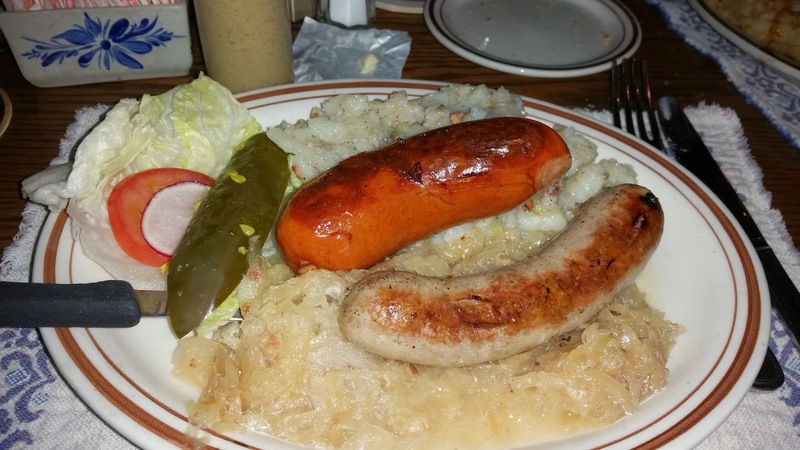 I went with the Bayerische Spezialitäten (Bavarian Specialties): choose any two sausages (Bratwurst and Knockwurst) grilled & served with potato salad & sauerkraut. Unfortunately, this was disappointing. The Bratwurst tasted like a hotdog and not even as good as the concession stand hotdogs from the Yankee Stadium. The Knockwurst was not better. The sauerkraut was the best part; it was eatable. The potato salad was too sweet. These German wieners were an epic fail. 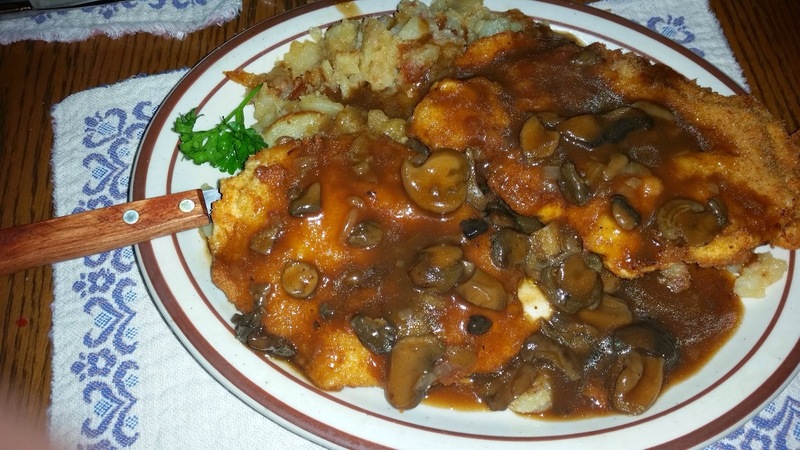 Hühnerjäger: the ‘chicken hunter,’ thinly pounded cutlets, lightly breaded and topped with our delicious hunter mushroom sauce. This was excellent. The mushroom sauce made the dish and tied it all together. The chicken was tender and the “lightly breaded” was light, just enough to keep the cutlet together. Reminded me of the Japanese Tonkatsu. You don’t feel like you are eating all the bread crumbs. Apparently, this is the dish that made Zum Stammtisch famous. I can totally understand why. I wish I had ordered this dish instead. I am realizing what my mistakes are. Seems to me that none of my foodie friends wants to influence what I order when we meet at restaurants they have been to. They all know so much more about what is good at a particular restaurant and they don’t always tell me! So that’s what happened at Purdy’s Farmer & the Fish, Krolewskie Jadlo (King’s Feast), and now again here. I ended up eating second-rate food and am always jealous of what’s on the other plate. Gotta have a conversation with these people! Overall, Zum Stammtisch was underwhelming and not worth the drive (and I didn’t even drive to get there). I liked the bread but the butter should not have been so cold when it came to the table. The wieners were such a disaster. How can they possibly be famous for their sausages? I may go back for the Hühnerjäger just to give it another try. Is this biased? I can only honestly write about what I felt and tasted at the time.